So, off we went to Dubai to begin the project with a week-long planning workshop. Initially, we met with our new client, Emaar PJSC. The first thing we learned was that they were in the middle of holding a design competition between several international architects to design what would become the world’s tallest building. Eventually a design prepared by SOM Architects was chosen. The new tower would reach 828 meters in height and contain 162 stories. 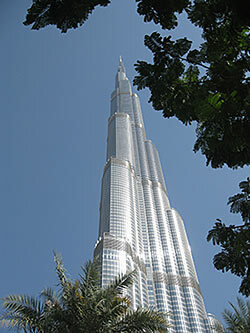 It is now known as the Burj Khalifa. The project site encompassed a total of 416 acres of land located at a major intersection along Sheik Zayed Road, the main thoroughfare running through Dubai. As we began to develop concepts for what was to be known as ”Downtown Dubai” one of the first elements was to design a central lake which would become the main focal point of the project. It would have a park that was the connection between Burj Khalifa and the lake. Adjacent to the lake and Burj Khalifa the largest shopping mall in the world was sited overlooking the lake with a grand promenade along the lake. The shopping center would contain nearly 4 million square feet of retail space. Just to the south of the mall was to be one of several hotels in the project and was dubbed “The Mall Hotel”. Another of the client’s requirements was that they had a sub-project of four residential towers that they had previously designed for another project and hadn’t used. So, they told us that we had to find a site along the lakefront that we could configure exactly as the architect had configured it. This project was the first to be constructed at Downtown Dubai and as soon as we set the location for it, they began construction of it, even before we had completed the master plan. The final piece of development along the central lake was what was called “Old Town Commercial Village”. It was a very unique project in that the visual and urban design character of it was a strong counterpoint to much of the modern architecture of a majority of the other new buildings in Downtown Dubai. 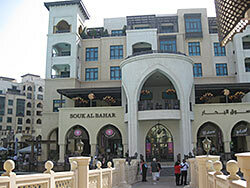 It was designed with a “Bastakia” style architecture which is found in many of the older areas of Dubai. Historically, this style of traditional architecture was heavily influenced by the need to protect inhabitants from the extreme heat and harsh environment of Dubai. The window and door openings are deeply recessed to provide shade. Buildings are situated around courtyards to provide opportunities for cross ventilation naturally. Traditional “wind tower” elements are utilized so that natural “chimneys catch the wind and provide natural air conditioning. The Old Town commercial area contained two hotels, shopping venues and restaurants overlooking the lake. 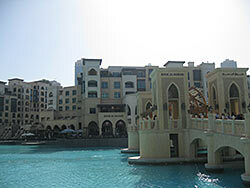 Dubai Mall also contains several dining venues which overlook the promenade and lake. Every night, diners and pedestrians can sit in the restaurants and along the promenade and enjoy a computerized light, fountain and music show which takes place in the middle of the lake. Adjacent to the Old Town Commercial Village across Dubai Blvd. there are two additional Old Town areas with similar design and architecture. The contain primarily mid-rise housing and two hotels. At the main intersection of Shiek Zayed Road and Doha Road, adjacent to the entrance to Downtown Dubai, there is an office park where the client, Emaar PJSC and many other prominent international companies maintain their Middle East headquarters. The remainder of Downtown Dubai contains mainly high-rise residential and hotel uses, ranging in height from 12 stories to upwards of 60 stories. There is also a main mosque and international school and several local parks for the resident’s use. Sheik Zayed Road, which is adjacent to the northern edge of Downtown Dubai has a series of office buildings running along the south side of it. They are basically one parcel deep and provide actual separation of Downtown Dubai from Shiek Zayed Road. 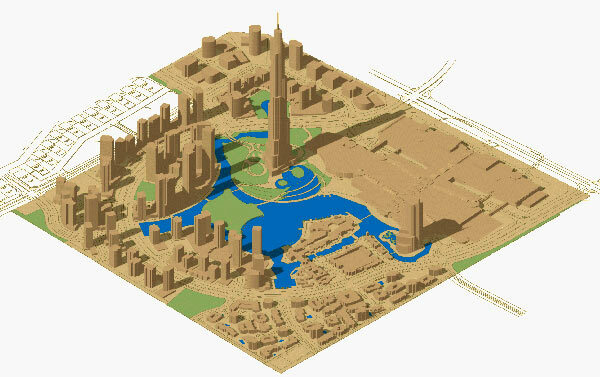 One interesting aspect of the master plan preparation was that the client did not want people in those towers to be able to see the central Burj Dubai Lake. So as planners and urban designers, we created 3-D computer simulation models which we then utilized to determine which towers would have views of the lake. We then moved residential parcels around and manipulated allowable building heights as a means of blocking those views. This was also accomplished through a set of detailed design guidelines which we also prepared to the development. They stipulated planning and urban design criteria such as maximum allowable building heights, building setbacks, maximum floor/area ratio. parcel entry locations, minimum open space requirements and maximum allowable floor areas for each development parcel. Unlike most other development projects, by the time we completed the master plan and design guidelines in late 2003, the lake and several of the buildings were already under construction. Because of its location and high visibility internationally as well as the fact that it contains the current “world’s tallest building” this was a dream project for a land planner!